It seems that in Australia those who ride Harley have a different perspective of what it means to be riding Harley. In the US Harley has couple commercials that can be called sexist, because of just the perspective that motorcycles are a tool to pick up women. However, in Australia they Harley has release totally different commercial targeting real Harley. The commercial is to represent the candy custom paint job from Harley Davidson. They have done a great job in presenting the custom candy paint on 2013 Harley’s. Take a look below at the new commercial, and let us know which commercial you would want to see more often, sexiest commercials or regular commercials? The 2013 has been a big year for Indian Motorcycle and Harley Davidson. 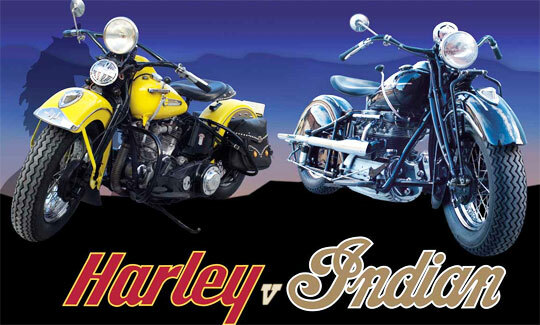 However, I do believe that Indian steered up some of the fame from Harley Davidson 110th Anniversary. As we get close to the release of new Indian Chief in 2014, Indian does not plan to stop just there. They are currently planning out their move to Indian and China. What we were not expecting is for them to make the move so soon. Under the management of Polaris, Indian is looking to catch up to Harley and steal more than half of Harley’s market. We all know that Harley has a strong presence in Indian and has been there already for 3 years, and is starting to make couple of Harley models in India. Are you ready for the Harley Davidson World Ride? I know I am, and its time to plan my trip with the new ride planner provided by Harley Davidson. But before I get to plan the trip I need new gear for the road trip. If you plan on heading out make sure to pack only things that you will need. Don’t take stuff that you will not use once on the trip. Following RoadPickle? I hope so! Check out what sash had to say about our leather jackets! Don’t hesitate follow Sash on her twitter account to keep up with updates on eBikerLeather products. As you can see our merchandise is getting tested for 6 months long trip and so far it is keeping Sash and Highway comfy! Gearing up for the longer ride is important, that is why I strongly recommend gearing up with eBikerLeather! Right now if you order any item from our store and use coupon code BLOG12 our crew will insert a 10$ off coupon code. Not 10% off but 10$ off coupon code that is valid for a month. Was your dream working for Marvel? If so check out Harley Davidson and Iron Man 3 they have teamed up to give you exclusive show down for May 3rd; the release day for Iron Man 3. Harley Davidson has come up with a cool way to promote Iron Man 3 and to give you a chance to create your own Avengers comic. All you have to do is create a hero and pick your machine. At the Comic-Con if your story and bike gets picked you will be the winner of Harley Davidson Street Bob motorcycle designed by you. Good luck, and make your story inspiring and interesting. For those who don’t know who Kuryankyn is they are huge in motorcycle aftermarket parts, and motorcycle tuning world. So the 2013 catalogs feature more motorcycles, and aftermarket parts for your motorcycle. While some of motorcycle aftermarket companies issue one huge catalog, Kuryakyn has a different idea; they have issued not 1 but 3 special catalogs, and each edition is dedicated to different bike! The catalogs are Harley Davidson, Metric Bikes, and Honda Goldwing edition. Briefly the Metric offers parts and accessories for Victory, Honda, Yamaha, Kawasaki, Suzuki, Can-Am, and sports bikes. While the Harley Davidson catalog is broken up into section like Touring, Softail, Dyna and my favorite Sportster. Check out each of the editions below, and focus your eyes on this cool video promoting the 3 catalogs. I have to say that I am glad to see Kid Rock in the promo video for Harley Davidson. I believe that their partnership will show much more to Harley Davidson fans. Not only that but fans that follow Kid Rock they will fall in love with Harley Davidson. The partnership bring together Harley Davidson as title sponsor of Kid Rock’s Rebel Soul tour; on which Harley plans to offer, and exceed your expectations with their attractions at each of the 60 stops during the Rebel Soul Tour. If you have missed Daytona Bike Week this year, you can still catch up next year. However, you missed a lot of fun! For example, Indian Motorcycles showing of their new Thunder Stroke 111, and Harley Davidson showing of their new addition to Harley Motorcycles, which is Breakout. There are tons of more events that you have missed. There is always next year, for now enjoy this great selection of Daytona Bike Week 2013 pictures provided by Jack Mcintyre & Chopper Dave from BikerPics.org. What I really love about BikerPics.org is not only that they have the best, hottest pictures from events but they know how to have a great time. Recently I have noticed that BikerPics.org offers E-Magazines and that grabbed my attention, so I gave my eyes glance at “The Pre Bike Week Issue”. The issue left me speechless, it was harder to take my eyes of motorcycles than the babes. I strongly suggest checking out E-Magazines at BikerPics.org, you will not be sorry that you spend that 10 minutes feasting your eyes on their magazines. FYI… a new issue came out March 15th, and its packed with even better pictures than the first issue. Another cool event that has happened was Vince & Amanda engagement at Bike Week 2013! Vince proposed to Amanda, and she had no idea what was coming her way. Check out the video below. Like I said, in the beginning next year is your year to ride on streets of Daytona Beach. A big thank you to BikerPics.org for keeping up with events at Daytona Bike Week 2013, and for sharing really cool pictures, and videos. I know you want to see more of Daytona Bike Week 2013, that is why I am inviting you to check out BikerPics.org YouTube Channel! **All picture rights are reserved to BikerPics.org. **eBikerLeather.com does not own any rights to the pictures provided in this post. Harley Davidson has unveiled the all new Breakout at Daytona Bike Week in Florida. The new Harley is eye catching, and loaded with premium features. Breakout will feature Twin Cam 103 V-Twin power unit in black trim with chrome accents. Breakout features new classic design, that allows for wide customization. With its big wheels, big paint and classic drag bike attitude meeting premium and modern refinement in this new attention grabbing performance cruiser. Harley’s Not Only For Adults? Hands on Harley Davidson in Betty Brinn Children’s Museum. As we mentioned already thousand times Harley Davidson is stepping up their game with celebration of 110th Anniversary. Harley has founded the Hands on Harley Davidson program at Betty Brinn Children’s Museum. The museum invites children to learn, and explore a pretended motorcycle dealership. The exhibits feature Harley Davidson Road King and features Dream It, Built It, and Ride It using activities that promote science, technology, math , and engineering. Children are allowed to design their own unique motorcycle with using interchangeable custom motorcycle parts and accessories. For example, seats, saddlebags, mirrors and variety of engine components. Once children finish building the bike, they can gear up, and hit the road on a virtual interactive video. The video provides first person experience, which include U.S and international touring routes. The virtual ride provides audio, turn signals, sound of V-Twin, wind effects, and throttle to control the speeds. The virtual experience of Harley Davidson bring activities like math challenges, maintenance, fuel information, exhaust information and other system information to ensure safety. Harley experience also provides real videos of dealerships working on either fixing up a motorcycle or selling one. If you are in Milwaukee, than Betty Brinn Children’s Museum is your destination for your next Harley. I have to say that Harley has really stepped up and brought a lot more to the road than I have expected. Harley introducing motorcycle to kids is a great marketing tactic that will surely keep kids wanting a Harley.